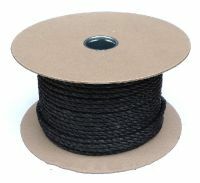 We provide a number of finishes for cut rope purchases. Add a ready-to-use spice or loop to the end of the rope or prevent fraying by adding a cap or whipping the end of the rope. Finished ropes are handy for all sorts of ropes from sailing ropes to garden decoration. It’s easy to add a finish to your rope; once you’ve added the rope you want to your basket find the finish you want and the corresponding rope size. Add more finishes for more ropes in the same order. Adding a splice to your rope will ensure your rope loop is as strong as possible. You won’t have to tie knots that will shorten your rope and might not hold. Heat set end caps and whipped ends are recommended for natural rope such as natural hemp rope rather synthetic rope as these are already heat sealed. If you have any questions regarding the right finish for your use don’t hesitate to contact us.